In honor to the 20th anniversary of Selena Quintanilla-Perez’s death the WRC would like to take a moment and view her success not only as a women but a Hispanic women in a world that is mainly dominated by men. Selena Quintanilla- Perez was born on April 16, 1971 in Lake Jackson, Texas her life was anything but simple; and by the age of 10 she was the lead singer in her family’s band, Selena Y Los Dinos. The band featured Selena’s brother Abraham on bass guitar and her sister Suzette on drums. The band was produced and managed by their father Abraham, Jr who was a former musician. I guess I can say that music is in their blood. In 1980’s Selena [Y Los Dinos] became every popular with Tejano music fans; and in 1987 at the Tejano Music Awards she won both “Best Female Vocalist of the Year” and “Performer of the Year”. Then in 1990 was when her first gold record hit with the album “Ven Conmigo”. Same with her 1993 album “Live”. Her next goal was to watch her English- speaking album “Dreaming of You” rise to number one. Unfortunately, she didn’t live to see the success because she was shot by Yolanda Saldivar, the founder of the Selena’s fan club, and died on March 31, 1995. The hit movie Selena directed by Gregory Nava captured the life of Selena. The role of Selena was played by Jennifer Lopez and Edward James Olmos as Abraham Quintanilla, Jr. This movie created a new connection between Selena and her fans. The movie itself made about 60,000,000 dollars in box office her legacy continued even after she had passed. Selena made an enormous impact on the Hispanic culture because of her lively personality. Performing was something that she was passionate about and it was something that she carried in her heart. That same feeling made little girls want to be like her, and adults loved her music. It is not every day you can run into with that amount of passion from someone. On April 30, 2015 Gaby Espino, Venezuelan actress and model, and Pedro Fernandez, recording artist and actor, hosted the Billboard Latin Music Awards. It was a night full of excitement and memories. 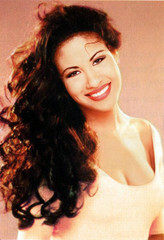 Twenty years after the tragic death of Selena she was still remembered by the Hispanic community. A special tribute was in favor of the beloved singer and for this tribute Jennifer Lopez was asked to come back to sing as Selena. This time Los Dinos, A.B Quintanilla (brother of Selena) Suzette Quintanilla (sister of Selena) and Chris Perez (Widow), joined Jennifer Lopez on stage for one more tribute. We at the WRC are hoping that the Quintanilla family has reached their goal of never letting their beloved sister’s dream down. I am in pleased to know that such an incredible young women being honored for the impact she has made on her community.